Discussion in 'iPhone Jailbreaking' started by f4780y, Jul 2, 2011. Well OK, not just for dummies, for all of us who ever want to upgrade, downgrade, or jailbreak our iPhones! From time to time we will need to use DFU Mode. This little thread explains what it is, why you need it, and how to activate it. Once you've done it a few times you'll be a DFU expert and be able to activate it in your sleep. Device Firmware Update (DFU) mode is a special failsafe mode which Apple has built into all of their devices so that they can restored to a stock iOS firmware regardless of the state they may be in. 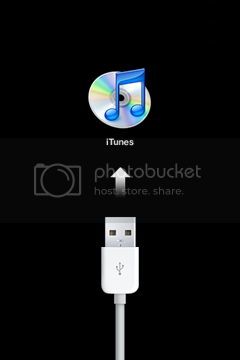 It is implemented at a lower level than the normal recovery mode, which shows the "connect to iTunes cable" graphic on the screen of the iPhone. DFU mode by contrast has a completely blank screen so there is no way to tell you are in DFU mode by looking at the device. What's the difference between DFU and normal recovery mode? DFU mode by contrast is working at a lower level in the bootloader environment, which happens without any interaction with iOS. This is the very reason DFU mode saves us from a corrupted firmware, because it is not a part of the iOS firmware at all. As already stated, when you are in DFU mode the screen stays blank. When iTunes communicates with the a device in normal recovery mode it it may not find things quite as it expects if you are jailbroken. It is for this reason (and probably quite a few others) that using recovery mode will invariably fail if you are trying to update or restore a jailbroken iPhone resulting in a rather cryptic iTunes error. In DFU mode the firmware is irrelevant and the restore will always succeed (assuming there is not a hardware fault). It basically wipes the storage and installs a fresh iOS regardless of what is there already. DFU Mode is the reason it is it is impossible to brick your iPhone through software. When do I use DFU mode? So I can use DFU mode to downgrade to any firmware I like? Yes, BUT have you heard about SHSH Blobs? Using DFU mode does not and cannot bypass Apple's firmware signing security model. If you want to install an old version of iOS you MUST have saved SHSH Blobs for the version and device you want to install it on. How do you activate DFU mode? In order to put your device into DFU mode, with the iPhone connected to a power source (USB or mains) and turned on or off (it doesn't matter), you must press the "home" and "power" buttons together for EXACTLY 10 seconds at which point you must release "power" but continue to hold "home". After about 15 seconds, the device will enter DFU mode. There is no way to tell from the screen that this has happened as it will remain blank. If you see the Apple logo, the "connect to iTunes" graphic, or anything but a blank screen, you got the timing wrong. You can just try again until you get it right. It is perfectly normal for the iPhone to reset just before the 7 second mark. Do not be put off by this. The timing of your button release must be exactly 10 seconds. It is best not to even look at the screen! You may like to try using your watch or a clock to get the timing precise. Hold both buttons, count to 10 seconds exactly, release the power button but keep holding home. Simple! A slightly alternative method which you may prefer (this is the one I use), is to hold both buttons until the iPhone resets (screen turns black) then count to 3 (and a bit!) and release the "power" button. This is exactly the same timing as the first method, it's just your trigger point to start counting is 7 seconds into the process when the reset occurs. If everything went to plan iTunes should now recognise a device in recovery mode and prompt you to restore it. On Windows, it may take a few seconds to install DFU mode device drivers if this is the first time you have used it. DO NOT interrupt the process. Otherwise iTunes will never recognise the device and you'll have to do a bit of maintenance in the control panel to get things working. If this happens, try plugging the iPhone into a different USB slot, but have patience! Be sure to connect to iTunes when you want to get out of DFU Mode. so what to do when itunes gives error 3194 iphone could not be restored????? Has any alternative timing been discovered for all the devices like mine (3rd gen iPod 64gb) which don't respond to this timing? My home and power buttons seem to work fine, but it won't go into DFU mode weather on or off, plugged in or not, iTunes open or closed. No, there are no alternative timings. This is coded directly into the hardware and cannot vary or be changed on any Apple device. All are identical. If you are not able to get into DFU, either you are doing it wrong (and it can take a LOT of practice), or your device has a fault. But if both buttons work properly, this would be extremely unlikely. To be clear on the instructions, it MUST be connected to your PC by the cable. It will NEVER work without. Whether the device starts on or off is irrelevant, as is whether iTunes is started or not. Perhaps consider using one of the jailbreaking tools to help you get into DFU mode. redsn0w, ac1dsn0w, and sn0wbreeze all have on screen timers which help you nail it exactly and tell you if you have achieved it. redsn0w is probably the easiest to use. Download redsn0w, go to "Extras", and press the "Pwned DFU" button. You will be guided precisely with the timing on screen (once in DFU mode, you do not need to do anything else with the tool. It will not jailbreak your device if you use this option). Thank you for the suggestions. I know quite well how to get into DFU mode and have done it many times with iPhones and iPods. This particular iPod just won't go. The only thing I can think of is that one of the buttons isn't registering that I am holding it rather than just having pressed it and released. If this is the problem then I wouldn't notice that the button is broken because I usually just press it once when I'm not trying to enter DFU mode. You say 'extremely unlikely' which implies a small chance. This stinkin' iPod is unfortunately one of those small chances. What if my power button does not work? I have an iPhone 3GS 32gb. I am running iOS5. It all started with my phone being in a on and off loop. While also saying activation required. I could not restore the phone do to the loop. And read online that putting it in restore mode would help. So I held down the power and home key for a bit then released the power but still holding the home. Then the iTunes logo and the USB came up. iTunes recognizes and says it is in restore mode. When the restore is almost done it gives me unknown error code (1). How can I fix this. This is not a jailbroken phone. I tried the dfu mode just now. And the same thing still happens. Make sure you have the latest iTunes. That's important. I tried that all ready. I even went to apple today while it was still under error code 3194. Tiny umbrella doesn't wanna work for me as well. When I'm in dfu/recovery mode I get error code 1. I use Recboot to exit the mode and try again with the host edited and Microsoft essentials off, and get error code 1 or 3194. And what if there is actually something that somehow is "blocking" your DFU mode? i don't know if this is a common issue but definitely this happened to me yesterday when I was downgrading my iphone 4. 3 days ago I tried to restore my iphone 4 with no succes. My plan was to put my iphone in pwned DFU mode (with the lastest version of redsnow) and using a custom IPSW firmware, restore my iphone to 5.0.1 (and be able to preserve my 4.10.01 baseband). I put my iphone like 4 times in DFU mode, but due to errors 3194 and 2005 I couldn't restore the iphone. Yesterday I fixed errors 3194 and 2005 but somehow, when I tried to put my iphone into DFU mode, i couldn't. I tried with Redsnow and iFaith but both programs didn't recognise the DFU mode. My iphone 4 buttons seemed to work properly (sleep and home). I'm trying to analyze what happened, maybe redsnow blocked my DFU mode, but how? the iphone works but the only thing that is not working properly is the DFU mode. Can anyone give me a hand to solve this issue?